The Dramatic Question in Stories | Stavros Halvatzis Ph.D. IN a previous article I discussed how each act in a story is driven by a question it needs to answer. In the first act of The Matrix that question is: What is the matrix? In the second: Is Neo The One? And in the third: Can Neo defeat agent Smith and his cronies? But just as there are questions that frame each act, so there are questions that frame each episode and each season of a television series. 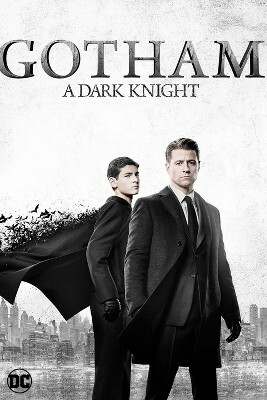 In Gotham, the first season’s overall question is: Who will win the mob war, and how will that affect Jim Gordon’s attempt to clean up the city, as he continues to solve specific crimes, while the overall series question is: How does Bruce Wane’s attempt to find the killer of his parents shape his transformation into the Batman? Each episode typically features a villain-of-the week and is driven by the dramatic question: How is this villain to be defeated? But the episode must also acknowledge the season’s question: How does the defeat of the villain affect the mob war? The death of the witness to the Wane’s murder, for example, would impact the entire series question — not that Cat is about to be killed off by the writers. The dramatic question also applies, with minor adjustments, to a book series. A book series, too, asks at least two overall questions. In my book series, The Land Below, the first novel’s dramatic question is: Will Paulie make it to the surface? In a future book, The Land Above, the question might be: How does Paulie, and his companions, survive the horrors that lurk on the surface? Each story in a series, then, is governed by several interlocking questions that not only drive a specific episode, but help keep the entire series on track. Sketching in the dramatic question for a series, season, or episode, prior to commencing the actual writing of the screenplay or book, is the first step in mapping out the direction of your story and its characters. This entry was posted in Story Design and tagged amwriting, Dramatic question, Ian1, novel, screenplay, screenwriter, writer, writetip on June 24, 2018 by Stavros Halvatzis. Warning : advise extreme caution the following response contain spoiler alerts. In a previous article you specify how asking the right story questions is what shapes the experience of the viewer’s investment with the story arcs . It is very important not to under estimate a viewer’s intelligence not to mention the time they have invested into a series. There are examples of well written television series where there are plot twists that are so unsatisfying it makes the viewer feel cheated. I invested seven years of my TV time into the main protagonist of Cartoon Network’s original series Regular show. The dramatic question of the series that kept me invested was weather or not Mordecai and Margret would end up together. Over 8 seasons /200 episodes later this unresolved question was answered by a devastating outcome by having Mordecai end up with a girl who has less then 30 seconds screen time and not a single word of dialogue. Other series that had horrific plot twists include : The true identity of the Gossip girl in Gossip girl , the secret life of the hero’s father in Revenge and also Ted losing his wife to cancer and ending up with Robin in How I met your mother. In short : It’s important to experiment with various plot twists to keep a viewer invested in the story but in the process not losing the plot of the single most important dramatic question of the overall story. There is a thing such as to much zigging and zagging. Thanks for the comments, Gerhard.